Located in the very centre of the capital of Slovenia, just steps away from the famous Prešeren square and the Three Bridges, Hostel Tresor offers a quality accommodation services in an ideal location. Listed among the unusual hotels of the world, Tresor is housed in a former bank built in Secession-Style and offers free Wi-Fi and air-conditioned rooms. All rooms can be opened via a card or a bracelet. 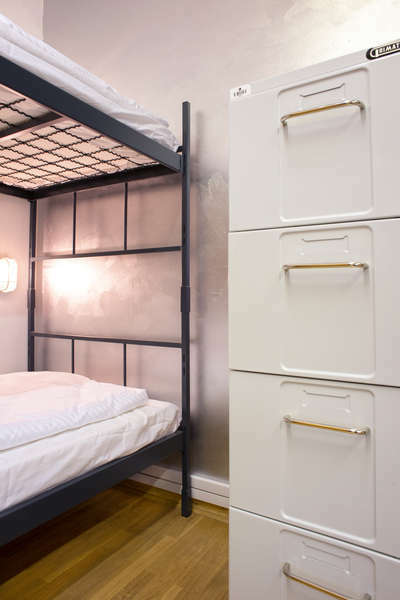 Dormitory rooms have been rearranged into smaller vaults in order to provide more intimacy. Shared showers and toilets can be found on each floor on two wings with abundance. Guests can relax in 2 common living areas and a dining area. The high atrium area with a sky ceiling is at its most vibrant during daylight hours while the former bank vault in the basement comes into its own in the evening. A bar, serving all kinds of drinks for a very economic price is found in the basement of the hostel, serving both guests and outsiders from 6:00 am to 10:00 pm. A grocery shop is in the same building, while a restaurant serving local and international dishes are all within 1-5 minutes walking radius. The city's main Bus and Train Stations are just less than 1 km away, and Slovenian’s International Airport is just 25 km away. In this regard, our hostel offers various assistances in helping the guests get these transportation services whenever needed. You can cancel your reservation free of charge up to 2 days before arrival (local time). For bookings made between 28th of December and 2nd of January, free cancellation is possible only if made 14 day before your arrival, otherwise a cancellation fee amounting to the cost of the first two nights will be charged. Please be advised that all payments that are made to HostelCulture are non-refundable. Free cancellation is possible 2 days prior to your arrival. In case of later cancellation or no show, you will be charged a cancellation fee amounting to the cost of the first night for each bed cancelled. Special conditions apply for bookings during New Year period ( 28.12-2.01) for which cancellation is only possible 14 days before your arrival. In case of later cancellation or no show, we will charge you the total cost of the first 2 nights as a cancellation fee for each bed cancelled. Please bear in mind that pets are not allowed in the Hostel.